Cox Automotive Industry Update Report: November 2018 - Cox Automotive Inc.
Economic Indicators: The Fed is on course to increase rates for the fourth time this year next month. Demand: Cox Automotive estimates that Used vehicle sales were up 0.3% YOY in October. The annualized pace of Used vehicle sales remains up 1% YOY. 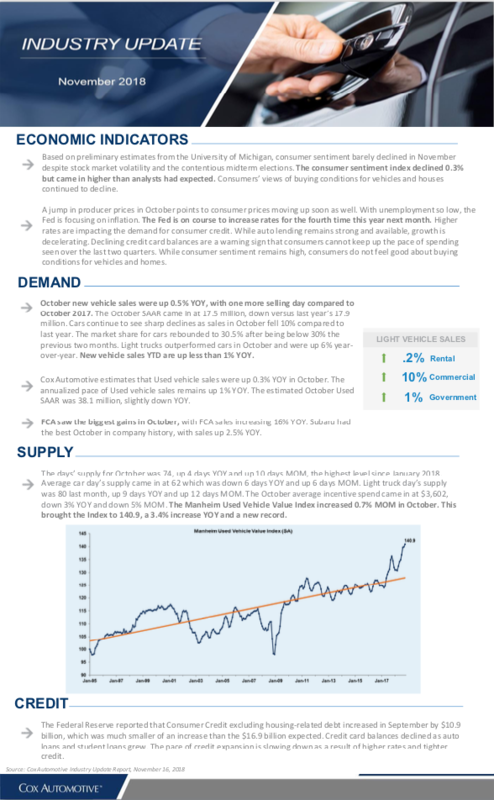 Supply: The Manheim Used Vehicle Value Index increased 0.7% MOM in October. This brought the Index to 140.9, a 3.4% increase YOY and a new record. The November 2018 Cox Automotive Industry Update Report shares Cox Automotive’s multifaceted insight into the automotive marketplace to provide an overview of economic indicators, supply, demand, credit and other vital topics and trends affecting the industry. Based on preliminary estimates from the University of Michigan, consumer sentiment barely declined in November despite stock market volatility and the contentious midterm elections. The consumer sentiment index declined 0.3% but came in higher than analysts had expected. Consumers’ views of buying conditions for vehicles and houses continued to decline. A jump in producer prices in October points to consumer prices moving up soon as well. With unemployment so low, the Fed is focusing on inflation. The Fed is on course to increase rates for the fourth time this year next month. Higher rates are impacting the demand for consumer credit. While auto lending remains strong and available, growth is decelerating. Declining credit card balances are a warning sign that consumers cannot keep up the pace of spending seen over the last two quarters. While consumer sentiment remains high, consumers do not feel good about buying conditions for vehicles and homes. October new vehicle sales were up 0.5% YOY, with one more selling day compared to October 2017. The October SAAR came in at 17.5 million, down versus last year’s 17.9 million. Cars continue to see sharp declines as sales in October fell 10% compared to last year. The market share for cars rebounded to 30.5% after being below 30% the previous two months. Light trucks outperformed cars in October and were up 6% year- over-year. New vehicle sales YTD are up less than 1% YOY. Cox Automotive estimates that Used vehicle sales were up 0.3% YOY in October. The annualized pace of Used vehicle sales remains up 1% YOY. The estimated October Used SAAR was 38.1 million, slightly down YOY. FCA saw the biggest gains in October, with FCA sales increasing 16% YOY. Subaru had the best October in company history, with sales up 2.5% YOY. The days’ supply for October was 74, up 4 days YOY and up 10 days MOM, the highest level since January 2018. Average car day’s supply came in at 62 which was down 6 days YOY and up 6 days MOM. Light truck day’s supply was 80 last month, up 9 days YOY and up 12 days MOM. The October average incentive spend came in at $3,602, down 3% YOY and down 5% MOM. The Manheim Used Vehicle Value Index increased 0.7% MOM in October. This brought the Index to 140.9, a 3.4% increase YOY and a new record. The Federal Reserve reported that Consumer Credit excluding housing-related debt increased in September by $10.9 billion, which was much smaller of an increase than the $16.9 billion expected. Credit card balances declined as auto loans and student loans grew. The pace of credit expansion is slowing down as a result of higher rates and tighter credit. Get the full November 2018 Cox Automotive Industry Update Report to learn more.